Courtesy of Lavinia Smerconish, Compass Pennsylvania, LLC. Westbourne Woods – A unique, custom build, combining everything on the must have list of the most discerning buyer: premier address; solid stone exterior construction, interior finishes evidencing the finest of craftmanship, generous square footage, unique spaces for both living and playing and acres of expertly manicured lawn. This is the home which all the superlatives really do apply. Westbourne Woods is the product of a marriage between the Main Line’s premier architect and most acclaimed high end builder. Just 14 years ago, F.L. Bissinger summoned one of his unique, Artisan Revival Style designs to E.B. Mahoney, whose name is synonymous with the highest in quality building standards. The resulting, expertly Colonial residence consists of three finished levels, positioned on 8 acres, with an additional adjoining lot of more than 6.5 acres available for purchase. Inside are 6-7 Bedrooms, 7 full baths and 4 half Baths, five fireplaces, an in-home theatre, wine cellar, indoor swimming pool, baseball batting cage, gym quarters and a 4 car Garage. Energy is partially supplied by solar panels. Twenty minutes from CC Philadelphia and a short drive from the links of the famed Philadelphia Country Club, drive through the gates of 1520 Monk Rd. Descend the driveway lined with stone walls which are finished with bricked lattice. Cross the cobblestones and enter the massive aged wood double door into a stone floored Foyer. Step down into the formal Living Room featuring floor to ceiling windows, exceptional quatrefoil plaster work ceiling and hand hewed plank hardwood floors. Pivoting between contemporary and traditional, this formal space is designed with multiple seating areas for small or intimate gatherings. Dramatic volume ceiling bar room with outside entrance is highlighted by an exposed stone wall with incorporated candle ledges for twilight entertaining. Steps away is a Library w/fireplace,Family Room w/fp, formal Dining room with hand painted ceiling. An expansive Kitchen w/solarium styled Breakfast Area w three sides of glass, encouraging views of gardens & wooded acres. Ascent the main staircase to a Master Suite w/two Sitting Rooms/private offices and separate hisand hers closets. Master Bath highlighted by stone soaking tub. The walk-out LL offers everything needed for recreation for all ages, theatre, wine celler, lap swimming pool, gym & baseball batting cages. Please, send me more information on this property: MLS# 1002351398 – $7,900,000 – 1520 Monk Road, Gladwyne, PA 19035. 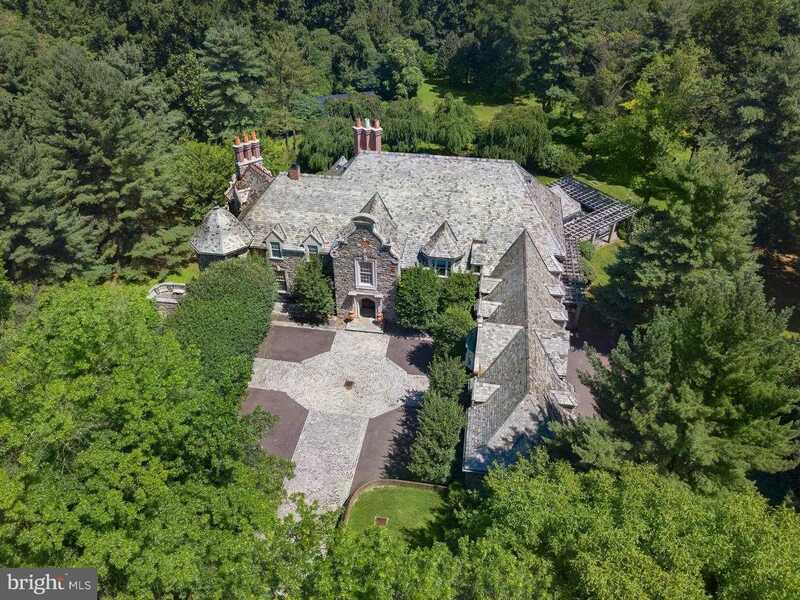 I would like to schedule a private showing for this property: MLS# 1002351398 – $7,900,000 – 1520 Monk Road, Gladwyne, PA 19035.